The 2014 Suzuki KingQuad 400FSi Camo carries on Suzuki’s tradition to offer rugged and reliable ATVs. Thanks to its tough construction, the Suzuki KingQuad 400FSi Camo has the potential to tackle any job with without backing down. It also gives you the possibility to select either 2WD or 4WD modes for enhanced practicality. 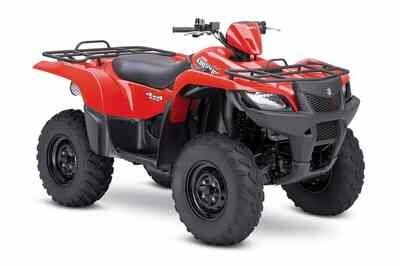 The King Quad 400 FSi is equipped with a 376 cc, 4-stroke, air-cooled, single cylinder, OHC engine which sends its power to the ground by means of a Semi-Automatic transmission with automatic clutch. The AT’s speed is kept under control by dual front hydraulic disc brakes which feature calipers with a large 34mm piston diameter. 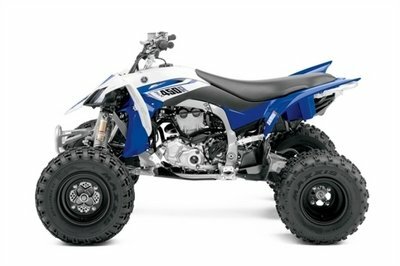 As far as suspensions are concerned the Suzuki KingQuad 400FSi Camo rides on front Independent A-arm suspensions and a swingarm rear-suspension system. 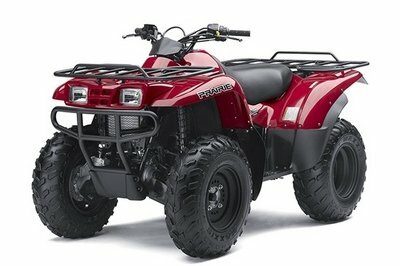 The ATV also comes with a T-shaped seat, an ergonomically designed handlebar and roomy footrests. Hit the jump for more information on the Suzuki KingQuad 400FSi Camo. Over three decades ago, Suzuki literally invented the 4-wheel ATV. The original Suzuki LT-125 established Suzuki as the First on 4-Wheels. The Suzuki KingQuad 400 lineup carries on the tradition of performance that rules. The KingQuad 400FSi Camo offers an unrivaled combination of exciting sport performance and hard-working capabilities. So whether you’re tackling a tough job or a tough trail, you’ll appreciate its impressive torque and remarkably wide power band. It also lets you select two- or four-wheel drive operation quickly and conveniently, which gives it the versatility to handle rough conditions, daunting chores - or let you enjoy a backwoods getaway. Its aggressive styling also reflects its willingness to take on tough jobs. The KingQuad 400FSi Camo 4x4 Semi-Automatic specializes in versatility. With its five-speed transmission and automatic clutch, it combines sporty performance and convenient operation. 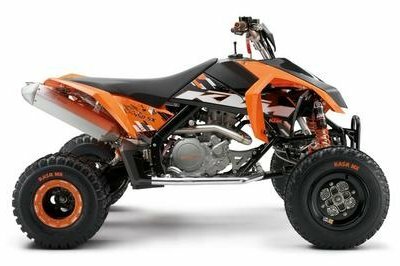 Since it’s a KingQuad, you’re in for an incredible combination of gutsy performance and lightweight agility. 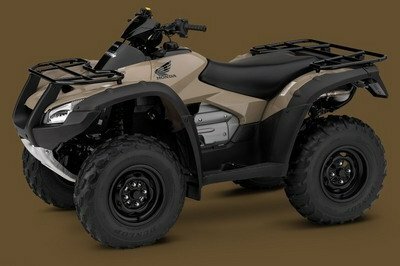 • The KingQuad 400FSi Camo features a fuel-injected 376cc four-stroke, four-valve engine with new cam profiles and inner structures of the muffler (for more powerful and efficient performance). • Suzuki’s class-leading fuel injection contributes to smooth power output, especially, in the mid-to-high range, as well as more consistent cold starts. The fuel injection system uses 3-D ignition maps for optimum ignition, targeting a responsive yet environmentally efficient performance. • Suzuki Advanced Cooling System (SACS) with factory-installed oil cooler and thermostat-controlled cooling fan helps cool engine during hard work or under excessive load. 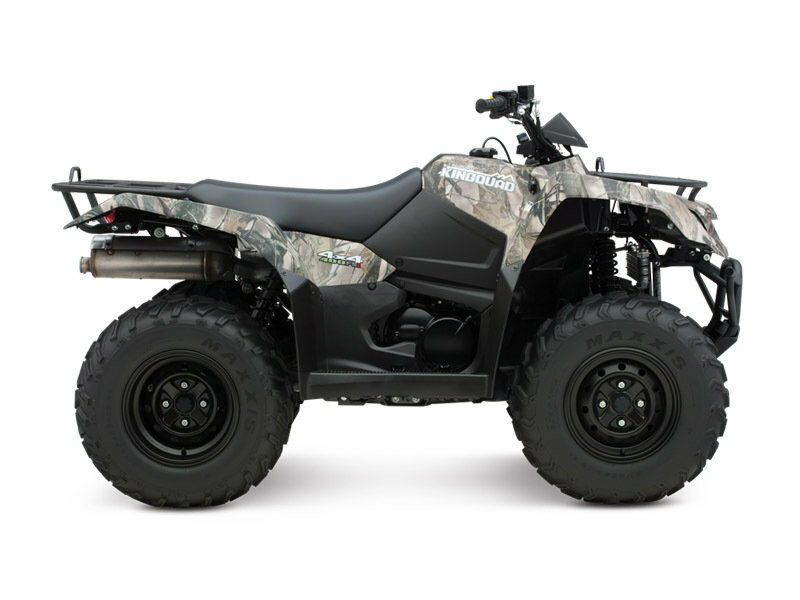 • The KingQuad 400FSi Camo comes with electric start. A start-in-gear system—functional when the rear brake is applied—allows starting the engine without shifting to neutral when conditions warrant. • A five-speed transmission with semi-automatic clutch with reverse allows the rider to select their gear position for maximum traction and fuel efficiency. • You can select two- or four-wheel drive operation with the flip of a handlebar-mounted lever. The KingQuad 400FSi Camo shaft drive system is reliable and durable, and provides nearly maintenance-free operation. • A torque-sensing limited-slip front differential provides maximum traction and light steering effort when in 4WD mode. • High-low selectable sub-transmission helps provide maximum versatility over a variety of terrain. An automotive gate-type gearshift lever lets you conveniently choose high- or low-range, neutral or reverse. • Suzuki’s innovative and exclusive T-shaped seat provides maximum rider mobility during sport riding and while tackling difficult terrain. • Overall length is under 82 inches so KingQuad 400FSi Camo 4x4 fits into a 6.5-foot truck bed. • Independent front A-arm suspension design offers smooth performance and remarkable ground clearance and allows 6.7 inches of wheel travel. • A swingarm rear-suspension system with 6.7 inches of wheel travel and class-exclusive twin shock absorbers provides agile handling and plush responsiveness. • Dual front hydraulic disc brakes feature calipers with a large 34mm piston diameter and maximum brake-pad surface area for increased stopping power and outstanding durability. • Large, 25-inch Maxxis tires with aggressive dual-stage treaded pattern offers consistent traction in wet conditions and a quiet, smooth ride on hard-packed trails. • Lightweight and strong plastic skid plates, sturdy enough to withstand pounding of trail hazards yet slippery to help let obstacles slide below. • Wrinkle paint finish on the racks and front bumper are durable and scratch resistance. Heavy-duty front and rear carrying racks let you easily take advantage of superb cargo-carrying capabilities. • LCD digital Instrumentation includes speedometer, odometer, tripmeter, hour meter, clock, fuel gauge and indicator lams for reverse gear, neutral, oil and FI. • Automotive-style DC power outlet on front fender. A winch-ready chassis and factory-installed flexible tube routing for wiring make winch installation simple. • Large 4.2-gallon fuel tank with fuel gauge for outstanding riding range. • Full floorboards with integrated raised footpegs provide protection. • Water-resistant underseat rear storage compartment.